PM says Hamas paid heavy price for rocket barrage yesterday, will pay ‘heavier price’ in violence persists. 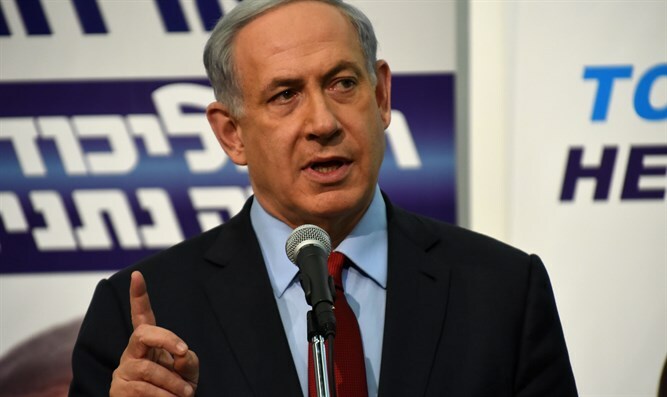 Prime Minister Binyamin Netanyahu warned that Hamas and other terrorist groups in Gaza would pay a heavy price if the barrage of rockets and mortars fired from the Gaza Strip yesterday continues. “Since yesterday, the IDF has reacted strongly against Gaza by attacking dozens of terrorist targets in the harshest blow in years,” Netanyahu said at a ceremony for the victims of the 1948 Altalena incident, when IDF forces fired on an Irgun ship bringing supplies for Israel’s War of Independence. “I do not detail my plans because I do not want the enemy to know what is in store for them. But one thing is clear to them – when they try us they pay immediately, and if they continue to try us, they will pay a lot more,” Netanyahu said. Terrorists from the Gaza Strip fired dozens of rockets and mortars into Israel Tuesday. One mortar shell struck near a kinderkarten. Three IDF soldierswere wounded by shrapnel from a rocket strike. One soldier remains hospitalized in moderate condition. One rocket damaged a facility which provides electricity to Gaza, cutting power to the Hamas-run enclave. Jordan: Moving American embassy to Jerusalem is a 'red line' Jordan’s Information Minister says there will be “catastrophic” repercussions if Trump indeed moves the U.S. Embassy in Israel to Jerusalem.